This book describes the history of the little-known emblems and distinctive markings of Russian military aviation from the early origins of domestic military aviation up to the Russian exit from WW1. The authors have managed to collect, and in some cases partially reconstruct, the majority of emblems and signs used in Russia during this period by military aviation units. The book catalogues the differences aviation motifs from the beginning of the formation of Russian military aviation. The collected material is presented in a clear and attractive form - color plates, reconstructed logos, and original photographs from public and private archives. This book is intended for a wide audience and at the same time will be a great help to researchers and historians seriously engaged in the history of Russian military aviation. This profusely illustrated book covers all the aircraft used, with brief details of their service use and comprehensive details of the colors and markings they carried. Besides the many photos, full color profiles illustrate the markings applied. Detailed color notes and precise descriptions and illustration of national markings over the period complete a book that will be invaluable to aircraft enthusiasts, historians and modelers. 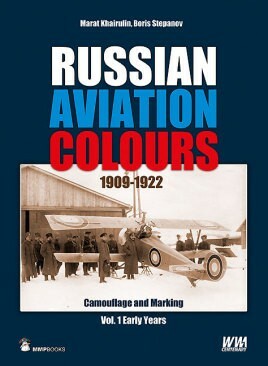 "MMP illumines the riveting history of early Imperial Russian military aircraft markings in Russian Aviation Colours 1909-1922 - the first of four planned volumes...Literally every page proved enlightening. A.V. Kazakov's color plates are superb. And many of the previously unpublished photos come from private archives...Rabidly recommended"
"contains the information as to who, how and why the national emblems evolved as well as the individual markings that appeared on the aircraft. The book provides a great deal of visual information and excellent resource for historians, researchers and anyone interested in early aviation." "provides visual information and excellent resources for historians, researchers and others interested in early aviation." "Provides a great deal of visual information, and is an excellent resource for historians, researchers, and anyone interested in early aviation."